Between her winning Channel 4's celebrity sporting series The Games and appearing on ITV's Celebrity Love Island, I was approached by management to develop a website for model and broadcaster Lady Isabella Hervey. A holding page was put live while a Flash site was being developed for her. Unfortunately she left her management before this could be completed. The development site features an intro and interface design. Designed almost two years before I came to design her official management site, the Kirsty Crawford fansite at kirstyc.com was a personal spare time project which was a great success. Site features include: fully customised phpBB forum, online diary updateable by Kirsty herself, fanbase-building banners, avatars, PHP-based webring and tell-a-friend system, specially edited video/audio and customised screen-captured galleries. 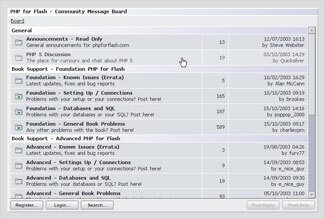 Now with over 1100 members and recently rebranded to follow the kirstycrawford.com colour scheme, the semi-official forum at kirstyc.com was a massive technical undertaking and is heavily customised both visually and on the backend. The forum now contains over 200,000 posts spread over two dozen forum categories and 9000 topics. Members get regular graphical e-mail updates and entry into regular competitions run through the community. 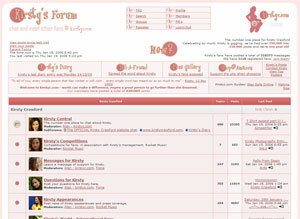 With the launch of kirstycrawford.com the forum was made semi-official. The Bethany Films website, no longer used but originally a portfolio site for my old video production company, features a highly innovative method for displaying the content. Site features include: All content loads into an overlaid layer, or content panel, which appears in the centre of the interface. The panel is draggable and even closable to return to the image at any time. Hand-coded PHP scripting enables intelligent features such as the ability to directly open any page in the content panel using a special URL, and a range of background images. Background images are changeable without reloading the entire interface using a unique PHP-based handling system on the homepage. Pop-up ‘site soundtrack’ plays streamed MP3s as you browse the site. Uses Flash MX for special ‘zoomable’ photographic images and stills. I commissioned and supervised this site and all content as part of my Editor role with publisher Friends of ED. This site supports one of my most successful books. The site design, created by Steve Webster under my guidance and supervision, follows the design of sample projects within the book, creating a continuity I was keen to build into the site. Key site features are covered in the book’s tutorials, making the site not only a promotional site but a living, working showcase of all the book’s case study projects. 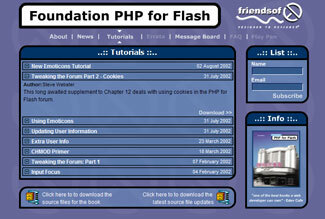 The site contained a stunning Flash forum (forums in Flash were a rarity at the time due to their complexity and indeed creating one was the final tutorial in the book). I commissioned a substantial amount of tutorial content to drive traffic to the site and there was a simple in-built CMS for updating the news on the homepage. I managed this site, reported on its use (with stats etc) to superiors and built up a 1500 member-base in a matter of months.